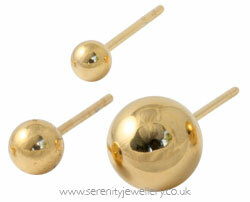 Hypoallergenic gold PVD coated 316L surgical steel ball stud earrings with matching butterfly backs. Gold PVD coated surgical steel looks like gold in colour only. If you are allergic to gold it is a great alternative. 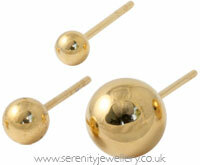 As pretty as solid gold balls but definitely more affordable. A classic that goes with anything. 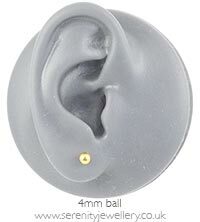 These have a similar color to 14k gold, and are a great option to pair with my 14k earring jackets. No allergies to speak of on my VERY sensitive ears. Sadly these earrings gave my daughter sore ears so won't be buying again. Were delivered quickly and better than imagined. Excellent item and arrived swiftly. Gold PVD surgical steel has a coating of Zirconium Nitride (ZrN) applied using physical vapour deposition (PVD) to create a hypoallergenic, long-lasting gold colour without using any actual gold.